Learn Italian in Ravenna at our partner school, Palazzo Malvisi. Situated in the historic city centre, Palazzo Malvisi is located in a recently renovated building. The school is run by a friendly team of staff who encourage a relaxed but professional atmosphere. The intensive course offers students a combination between Italian grammar and conversation, and consists of 20 lessons per week. Half board includes 4 dinners per week. Additional dinner costs € 15 per dinner. You will have a private bathroom when living in an executive host family. Half board includes 4 dinners per week. Additional dinners costs € 15 per dinner. The stated price is for an airport transfer on arrival at Bologna. Airport transfer on arrival at Rimini € 180 p.p. Please fill out on the booking form where you will arrive ("remarks"). 01/01/2019 - 20/01/2019, 22/04/2019, 01/05/2019, 23/07/2019, 15/08/2019, 01/11/2019, 14/12/2019 - 20/01/2020. Only individual lessons will be rescheduled. 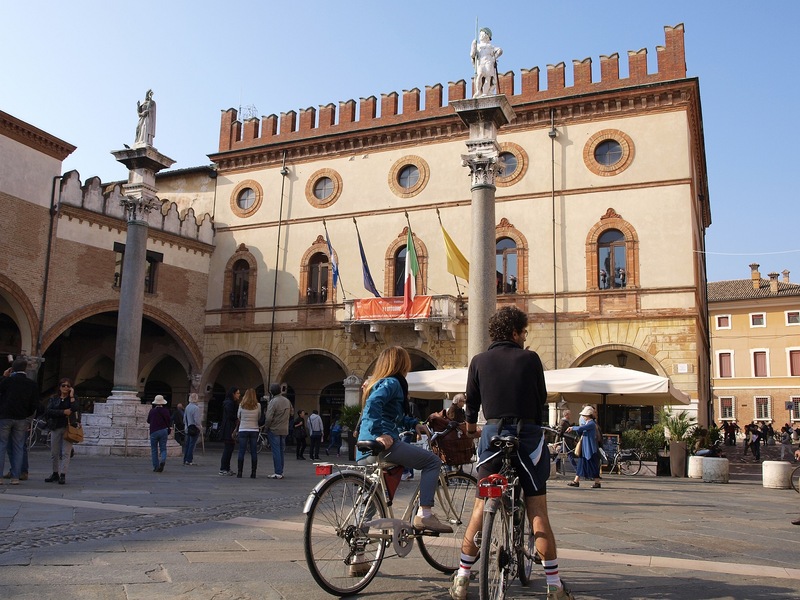 The combined course offers students wanting to learn Italian in Ravenna the opportunity to combine a group intensive lessons with 2 or 4 individual lessons per week. Aside from the intensive course of 20 lessons, you will receive two 3 hour cookery lessons per week about famous Italian cuisine, especially the delicacies of Ravenna and the surrounding region. After the practical cookery lessons in which you will prepare your own dishes, you will have dinner together with the teacher and the other students. The cookery lessons take place in the evening from 17.00 - 20.00 hours.. This course includes 20 Italian lessons, 2 cuisine lessons (17:00- 20:00) and 1 dinner with the teacher per week. Ravenna has had a very important role in Italian history. Similar to other important Italian cities, this resulted in a number of beautiful buildings, statues and the "speciality" of Ravenna: colourful mosaics. During this course, you will have 20 lessons of Italian as well as 6 mosaic lessons (in the afternoon) per week. This course combines 20 lessons of Italian with 6 mosaic lessons (in the afternoon) per week. Price of 12 mosaic lessons per week is on request. Aside from the intensive course of 20 lessons, you will receive two 3 hour Italian wine lessons. During this lesson special attention is given to typical wines of Ravenna and the surrounding region. And of course this includes a tasting session! The wine lessons take place in the evening from 17.00 - 20.00 hours. The course is designed for those who want to optimise their study time whilst they learn Italian in Ravenna. The aim of this programme is to offer a fully personalised method of teaching designed to meet the specific student's needs and desires. As the classes are private, the student will be able to decide the schedule and content. The duo course in Ravenna is ideal for students travelling together. With your travel companion, you will have lessons with a native-speaking teacher with a lesson program completely adjusted to suit your knowledge level, interests and/or profession. This course combines 20 lessons of Italian per week with 4 Byzantin art lessons (2 hours each lesson). The lessons can be combined with guided tours of Ravenna’s monuments or of other cities in Italy.The course is carried out in Italian and to attend it you need to have at least a level B1 in Italian. This course combines 20 lessons of general Italian with 4 Byzantin Art lessons. You can choose a single or double room in a shared apartment. The apartments are furnished and kitchens are full equipped. Bed linen is provided, but not towels. A double room is guaranteed only for two students who enroll together. If you choose to learn Italian in Ravenna, you can choose to stay with a host family, where you will be provided with bed and breakfast. The maxium distance to the school will be 30 mins walking. Bed linen is provided by the family, but no towels. You will be given your own keys and will be independent, but treated as a member of the family. If you choose to stay in executive host familiy accommodation whilst you learn Italian in Ravenna, you will stay in a larger room with your own bathroom and television. Bed linen and towels are provided by the family. You will be given your own keys and will be independent, but treated as a member of the family. This is the perfect option for those students who want to enjoy privacy and complete independence whilst they learn Italian in Ravenna.